Just received a set of .030 over aluminum pistons from Lang's. I suspect they're Chinese made but all Lang's could tell me was that they were made "overseas". 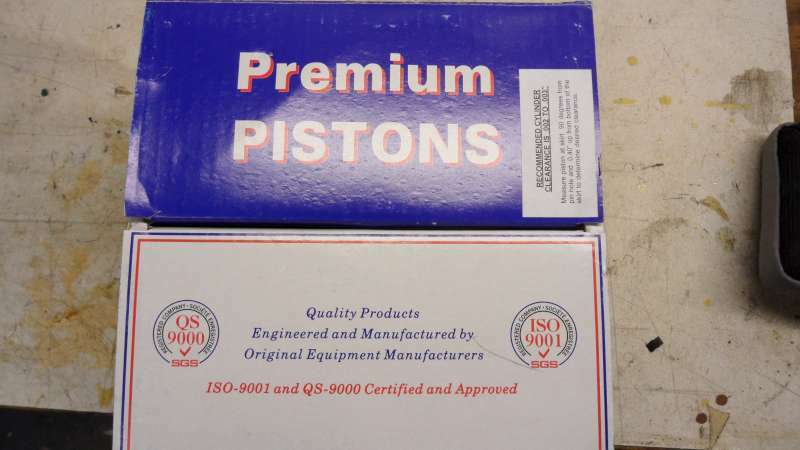 The quality appears good to my eye and I found it interesting that they claim to be ISO 9001 certified. Piston weights were 576g, 578g, 580g, 582g. Pretty close I think. 1. From the measurements are these cam ground ? 3. Rods were mixed with 2 being the "heavy" style and 2 being the new lighter rods. OK to mix ? I don't see how they can legally sell them without a COO, Country Of Origin label. No. 3====No, it is not OK to mix Rods. The pistons should be balanced, as they are to far off. Also balance the rods when you get a set! The measurements you have, were taken on the wrong part of the piston. You should be on the bottom of the skirt. Last and very important, don't use the clearances that came with the pistons, as 2, to 3n thousandths is to tight, they will score. They should be .004 Min., to .004-50 Max. If you are having a machine shop bore and hone your block, just take them the pistons and tell them to "fit them to the bores". Occasionally one or more pistons in a set may be very slightly different in size, so make sure they know that and measure all the pistons, not just one. I go a little heavier on clearance. .0035 is generally what I shoot for. That clearance is how much bigger the hole should be than the biggest part of the piston (which should be at the skirt 90 degrees to the pin). The biggest problem I have had with the pistons you show in the photo is that the pin bushing areas are sometimes undersize or slightly off center. Take the pistons to your local machine shop and have them hone the piston pin bores to fit the pins with .001" clearance... Yes, the ideal clearance is about one half of one thousandth of an inch, but you will have to take it out to .001" in order to align the bores and eliminate the fine machining marks because the wrist pin holes in these pistons were cnc bored and not line honed. The machine shop will hone these on a specialized honing machine that hones both bores at the same time in exact alignment. You can not accomplish the same thing at home with a brake cylinder hone or any hand tool. If you don't have the pins properly fit, there is probably about a fifteen percent chance that you will have a seized wrist pin "issue" at some point in the future. This piston pin honing procedure is usually a very minimal cost. Also, for about two years, I have seen that particular brand of pistons has been coming thru with wrist pins that are too short. How does your wrist pin look? Does it set about 1/8" inside the bore on each side when centered in the piston? Or is it farther in? Other than those two items that need to be adjusted or watched for, I have used dozens of sets of those pistons with no reported problems. I quit using them and switched to a different brand when they started coming thru with "short" pins. Supposedly the supplier shortened the pins because people complained that the pin ends were rubbing against the cylinder walls and causing damage... It wasn't that the pins were too long, it was because some of the connecting rods available at the time were not straight... But that's a whole other story! One thing to check on the wrist pins besides the fit in the piston. That brand of pistons, the wrist pin notch, is not ground center on the wrist pin. That is, the notch is off center, and it will hang out the side of the piston, past the piston, that you can get by with if you think is Good, but if you blow a rod, and the thrust comes off, the pin will grove your cylinder. Rick, there is a little label that says the country of origin, very small gold label! Rick and Joe: your right .... on the bottom is a tiny gold label, made in Taiwan. Gotta be better than made in the PRC ! 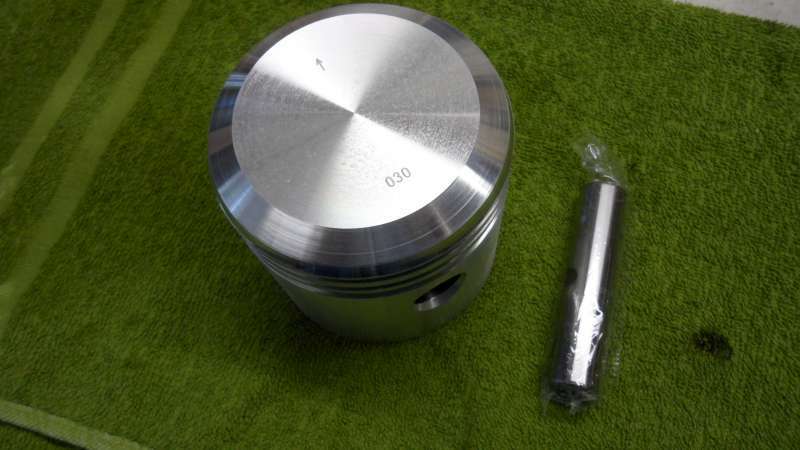 Kohnke: Is 6 grams (0.2 oz)differance between the heaviest and lightest piston really a lot? Also the bottom measurements shown were taken at the bottom of the skirt. 3.760 parallel to the pin and 3.775 at 90 deg to the wristpin. Adam: Wrist pins look perfect. I will measure clearance on the pins tomorrow. Still have 2 questions unanswered..... are they cam ground and .... do the clearances seem excessive for a .030 over bore ?? Does anybody actually think every company that manufactures engines is balancing pistons and rods to within a few grams (1 gram = 1/28 ounce)? Kohnke: Is 6 grams (0.2 oz)differance between the heaviest and lightest piston really a lot? "END Quote"
Just depends what is important to you! We Zero! ISO9001 is not a quality certificate in it self meaning that ISO9001 = high quality. What it means is, that once you have defined your quality target,your organisation and mode of operation are aligned to ensure that quality target is met, and if you find deviations, you have procedures to identify the root cause and fix it. HOWEVER - Normally it do mean that the enterprise have certain higher target of quality and the ISO9001 certificate then indicates that they take that serious. I will say one thing the pistons being made now are a whole lot better than some of the junk 20 years ago. I had some Jahns that one of them leaked compression through the top of piston, Junk castings! I also noticed that some one has changed these pistons to fit the problem with hitting Z heads and head gaskets on the over sized pistons, they are beveling the top outer sides for more clearance. I got mine from Snyders about 8 months ago. At the time they advertised them as the best avaliable. They worked for me. Egge Pistons = Made in USA by Americans. I suppose when you ballance the rods it is after they have been fitted to the crank with shims and nuts and oil dips? Now do you want the rods and pistons to weigh the same as a whole or do you want the rod ends at the crank to weigh the same? Could we get a procedure like, first you weigh the pistons and get them weighing the same then you weigh each end of the rods and get them weighing the same, etc?